9th November 2012. Get the latest news about what's happening on the site, and what's new in the shop, plus winner announcement and current deals you don't want to miss. All this and more in our current edition of the ExplorOz newsletter. Are you in the middle of your spring cleaning? Why not make some money from your unwanted gear using the ExplorOz Classifieds. A fast and affordable way to sell - we've just finished a major upgrade to the Classifieds system that makes it even easier for you to create and manage your ads, and don't forget there are unlimited free Display Ads available for ExplorOz members. The Classifieds Ad submission and edit system has been upgraded, with a faster image uploader, and a description field that makes changes as you type them. These upgrades make creating and editing your ads quick and simple, so give it a try today! As requested by regular Classifieds users, we've introduced a function to "Remove" your ad. This will expire the ad immediately rather than mark it as sold. So if your circumstances change, or you simply change your mind, you'll be able to Remove your ad at any time. Also, there are now three new tabs on the Classifieds home page; Your Current Ads, Your Incomplete Ads and Your Expired Ads. So if you get interrupted while creating the ad and lose your page, you can now access it again and finish the ad submission. Plus, if an ad has expired or been removed, you'll be able to reactivate it at the push of a button (standard ad rates apply for reactivated ads). 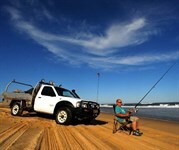 Don't forget to visit our Boating & Fishing section, covering everything from Beach Fishing to Where to Fish by State. Just arrived is the 2013 Tide and Bite Times Range from AFN. There's a pocket sized title for each state, and at only $7.95 each, these are a must have for any angler's tackle box. The Australian Fish Guide will help you identify your catch no matter where you are, and we have the Hard Cover edition, with water resistant pages, available for half price! That's only $24.98 - but hurry stock is limited. Cleaning your boat after a day on the water doesn't need to be a hassle. The Eco Trailer Wash - Ultimate DIY Wash System secures to your Trailer, and will wash salt and dirt off the underside of your boat quickly and easily. Each month we have a random prize draw taken from reviews submitted for items listed in our shop. Yes, it's as easy as that to be in the running for a $100 shop voucher, so to go in the draw, simply click on the "Your Say" tab on any shop item page and tell us what you think! Congratulations to October's winner: kym C1. Get to the best viewing spot in Australia! Cape York offers the best view of next week's solar eclipse, and we have all of the products to get you there! An essential for any Outback traveller. Includes the four new format GDT Maps, all packaged in a handy storage case with clear pockets. Capture great pictures on your next trip!